Corresponding secretary, Angel Smith, read a thank you note from Becky Greene from the library staff for the holiday luncheon. She also read a note from Rosemarie Ricci. A thank you message was sent to Elaine Perino for the ceramic pig collection on display in the library. Membership—Patti Phillips reported that 32 of our 67 members were present at today’s meeting. There were no visitors. 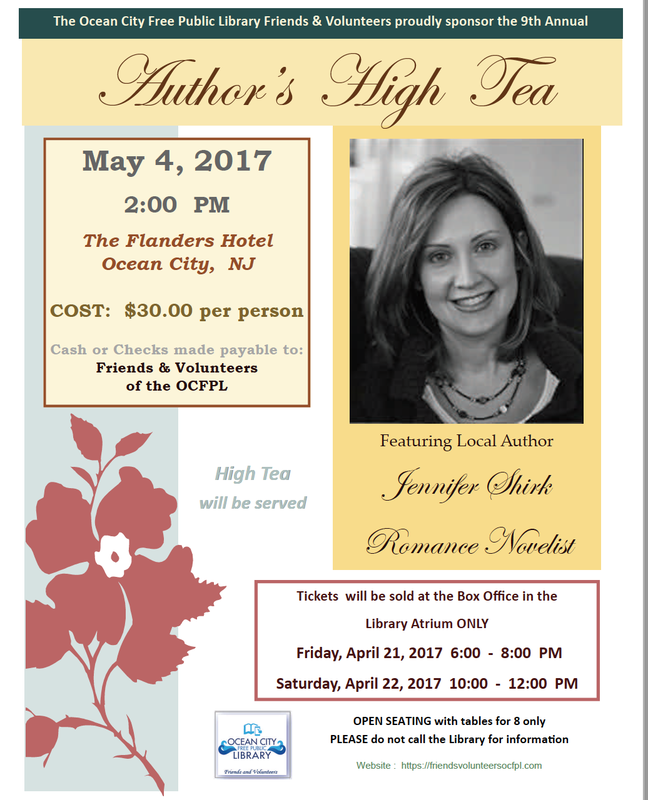 Author Tea/Luncheon—Joan Sambucci reported that Jonathon King will be the guest speaker at the Author Tea on May 3, at 2:00. The Tea will be held in the Garden Room of the Flanders. Cost will be $30 per person, and checks can be made out to the FVOCFPL. King wrote, The Sindia Promise. There will be open seating with tables of 8 and no limit on the number of tickets that can be purchased. Tickets will be sold in the library atrium on Friday, April 20, from 6:00 to 8:00 and on Saturday, April 21, from 10:00 to 12:00. She is working on an author for the Fall Luncheon. Speaker costs have drastically increased. The date for the Fall Luncheon is Thursday, October 4, 2018. Hospitality—Joan Sambucci reported that National Library Week will be April 9 – 13. A sign-up sheet was distributed for volunteers who are needed to greet patrons, give away freebies, and collect chance slips for the beach tag drawing. Two shifts of volunteers are needed each day from 9:00 – 10:30 and 10:30 – 12:00. Library Special Events—Babs Stefano distributed a sign-up sheet for the Edible Book Festival to be held on April 9, from 10:00 to 3:00. The contest will have categories for children and adults and features prizes for the most clever and punniest. Baby Bags—Pauline Kretzu reported that Joan Sambucci and Linda Robie will prepare the bags this month and that she and Gail Lapko will deliver them. Book Room/Book Sales—Jeanne Pless reported that the one day sale was successful. The next sale is on June 22. Sorters were asked to keep aside any donated coffee table books for an upcoming silent auction. 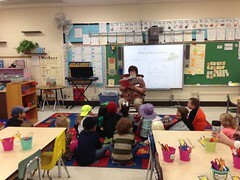 First Day of Kindergarten—Linda Robie reported that she is considering a new title, The Kissing Hand, for the program. 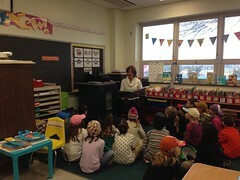 A meeting of the kindergarten committee will be held after the general meeting in May. 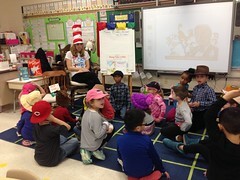 Read Across America—Kathleen Woodring extended a thank you to Leslie Clarke for ordering the materials and to all of the members who helped prepare the bags. The event was held on March 2, with the starting time being moved from 9:00 to 1:00 due to weather concerns. 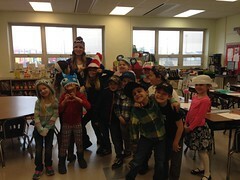 All of the readers were able to readjust their schedules. 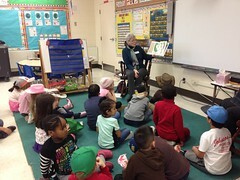 Readers included eight of our members, retired teachers and community members. The school provided some light refreshments for the participants. Thank you messages were sent to all readers, and some letters have been received from the students. 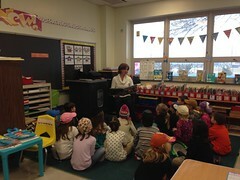 Reading Trees—Marge Roth reported that Judi Levy prepared the trees this month with the themes of spring and St. Patrick’s Day. Kathleen Woodring will do the trees in April that will feature Earth Day and spring. Special Projects—Cheryl Kelchner reported that the display case will feature an Easter theme with hand painted Easter eggs from the collection of Donna Brumell. The bulletin board in the atrium has also been redesigned with a spring theme. The donated Downton Abbey materials, to be used in the silent auction, will be displayed during April. Bids will be accepted at the ticket sales for the Author’s Tea, and a clip board for bids will be kept behind the second floor reference desk from April 21st to May 2nd. All of the materials are worth around $300. Starting bid will be $30. Third Grade Reading—Kathleen Woodring reported that the students are reading, How to Steal a Dog. The last meeting of the year will be held in April and will involve a wrap-up party. Debbie Moreland announced that Babs Stefano volunteered to be the Library Special Events Coordinator and Bobbi Taylor volunteered to assist. Debbie Moreland also reported that the check has been given to the Historical Museum for the summer camp program. Our sponsorship will be acknowledged in all advertising and our donation is appreciated. Debbie Moreland reported that she spoke with Karen Mahar regarding any needs the library may have that we could help with. Karen will check with the library’s branding company, Wiser Link, to see about new signage over the free book table. Our next meeting will be on April 9. It marks the beginning of National Library Week and the Edible Book Festival. The new member luncheon will follow next month’s meeting. New members, Doris McNorton and Liz Genco will be recognized. An email will be sent inviting everyone to the luncheon and Joanne Romano will be asked to set up an evite that will allow people to RSVP so that a count can be made to plan for the catering. 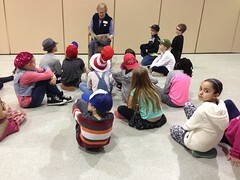 A motion was made by Babs Stefano and seconded by Barbara Riggione to reward the students that participated in the Third Grade Reading Club with a coupon, worth up to $10, to be used at Sun Rose Books to encourage summer reading. The motion passed. Carolyn Lothian announced that The Living Last Supper would be performed at the Tabernacle on Holy Thursday, March 29, and Good Friday, March 30, at 7:00. National Library Week – Monday, April 9 – Friday, April 13.